The HDT Rhino Anti-Fatigue Mat is soft enough to provide relief on your back, knees and joints while the surface is durable enough to hold up the stools and chairs with casters! This cushioned mat for standing is designed with a compound pvc puncture proof surface that is so tough it will hold up to high heels and comes with a 5 yr warranty. Choose from the Deluxe 9/16" thickness or Super Deluxe 15/16" thickness for the most rigorous commercial applications. Give us a call @ 1800-810-7847 or email service@commercialmatsandrubber.com for custom cut lengths! 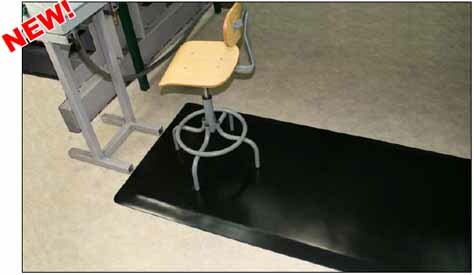 Pharmacies, retail spaces, assembly lines, salons and spas, or anywhere a heavy duty anti-fatigue mat is needed.